I just wanted to say thank you so much for making the perfect dress for me. It would have been impossible without you! No matter how chaotic everything else has been, I had my monthly dress fittings to look forward to and has without a doubt been the best part of planning for the wedding. Many many thanks for making my beautiful wedding dress. The whole process was so lovely and so much fun! So many people said how gorgeous the dress was and it was just so perfect for the day. We had an amazing time. I didn’t want to take the dress off. Thanks for just being so kind and generally fab. Just a note to thank you for all your hard work you put into my dress. It was all I envisaged and more. The dress looked as if it was made for an A list Celebrity and for once I enjoyed having my photo taken. We had the most fabulous day and I can safely say it was one of the best times in my life. I will be sure to point any new bride I know your way, so they too can benefit from your talent of dressmaking. I wish too that they will look and feel as fantastic as I did on my day. 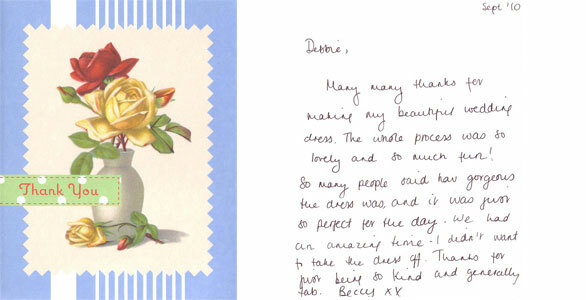 I just wanted to say a big thank you for my wonderful wedding dress & bridesmaid dresses. The dresses all looked perfect & the colours were fantastic. My dress was so beautiful – I didn’t want to take it off!!! Your hard work & foresight is so much appreciated as everything looked perfect. Thanks Debbie; you really do make dreams come true- mine did!!! All my love & thanks! It goes without saying but I am thrilled with the result! Thank you so much for making my vision come to life so beautifully! Your attention to detail is amazing … and very much appreciated. I have thoroughly enjoyed the whole experience of trying it on and seeing your work come together. Thank you so much for our beautiful dresses, your patience is truly incredible. You are a special extremely talented lady and your efforts will make Anna & Ben’s wedding day unforgettable. Thank you for making my wonderful bridal gown. It has exceeded all my expectations and dreams. You are so talented and have made me feel so special at every fitting. I will miss coming for fittings!! Thank you so much making me my perfect dress. I am so pleased with it + I can’t wait to wear it. I’d always recommend having your dress made now I know how much time, effort + skill is involved. I’ve loved all the fittings + you’ve been so kind + truly made me feel at ease + ive even forgotten all my insecurities. I’ll definitely keep in touch + I hope everything works out for you in the future. Thank you so much for my beautiful wedding dress. It was very much admired on the day with even total strangers commenting on how unusual it was! Most importantly Jeff loved it and thought I looked stunning. Thank you too for the gorgeous bridesmaid’s dress. Your support throughout the whole process was wonderful and your patience with me was excellent. I just wanted to say thank you for doing the most amazing job on my wedding dress. I can’t put into words how happy I was, it was just perfect. I really felt like a princess that day. I’m so glad I found you as I wouldn’t have wanted or trusted anyone else to make my dress. I also want to thank you for being so supportive after me Grandma passed away, it meant so much to me and my mum. I know that she loved my dress and will definitely have been looking down in approval. You have an amazing talent and I am honoured that you made my dress.